Thank you for sharing all of your wonderful photos from the Bower Bird Blues workshop….I knew you would and have been looking forward to it! It must have been so inspiring to join with all of those other talented creators (I would love to meet each one) and play with natural indigo together. Your amulet is so “you” and so beautiful. I love the variations of blue, moderated by that triangle of leather. I think it is the browny greeny quality of the leather that makes the other blues pop. Photographing it on the background of peeling paint just adds another dimension. I’m so glad you had the chance to do this, and took it. I want to play more with the leather! you will have to come to the Land Down Under one day Cindy they are magic birds, the males are blue black with crimson eyes the ladies are green-ish brown with beautiful blue eyes. When I lived on my own out in the bush with no electricity or running water back in the early 80’s I read, drew and stitched by kero lamp which needed a small blue funnel to fill it up each evening. I would find that blue treasure in the male’s bower every day, it was a game! I hope you will take the chance to cross the wide blue in the not too faraway, I dream of seeing the Boab trees in the tropical savannah of the far NorthWest of Western Australia in this life time! Looks mighty fine on peeling painted wood! that old door is a treasure! Thanks India, the photo was taken this morning on the old outdoor dunny door that fell off last year! the indigo feels very clean & gentle, there is no texture because the sendiment settles to the bottom of the jar, the amulet was submerged gently (so as not to introduce any oxygen) and massaged for about half a minute in the bath temperature indigo jar then rinsed in cool water. It has a slightly gamey alive sort of scent, more animal than plant, a bit like our cat Ariel! The cloths, leather & threads are all still soft and malleable but feel strengthened by the indigo like a conditioning tonic. The gardening yesterday helped get my feel back on the ground, it’s like the tropics with rain at night and steamy days so we’re busily trimming the wildness away from the pathways so our customers can get to their front doors and see out their windows! Absolutely glorious in every way! I love the way you put together these seemingly incongruous materials into a perfect whole – it truly is magic! It was such a buzz making the connection, call and response, gathering and sharing, with the blues holding us all together, a perfect way to begin the year, now it’s time to get back to editing the crow drawings! You’re a fine storyteller, Mo, and this was an especially magical one – in the reading and the viewing. Wishing you continued good times with the Blues as I think your idea about more leather is pretty darn compelling. 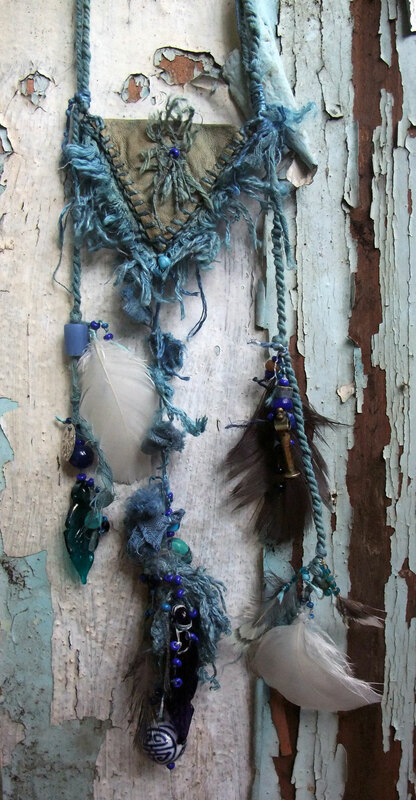 Gorgeous piece – so fitting to honour the magic of indigo in this way. I love your Black, White and Red amulet Heather and your story of how it came together! Beautiful! Beautiful! Beautiful! That’s the amulet. And the door is beautiful, too! I wish I didn’t need to go out for the day! I’m inspired. I’ll take a notebook with me to jot down some ideas if I get a moment. . . . I want to make some small woven pieces for the covers of books. look forward to seeing what you do with your covers!